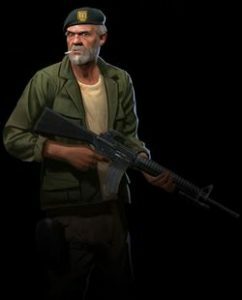 William “Bill” Overbeck is the eldest Survivor in both Left 4 Dead and Left 4 Dead 2, roughly in his 60’s. He is also the only playable character to have died. 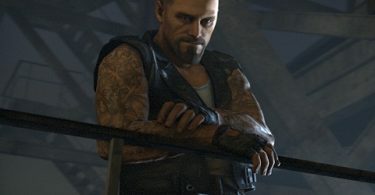 Bill is killed prior to the events of Left 4 Dead 2. In The Passing, Bill sacrifices himself to raise the bridge for his other group members to cross. According to the comic book, The Sacrifice, Bill is killed by multiple Tanks when he is reactivating the lift in the finale so his team can escape the oncoming horde. Bill is a Vietnam vet who served in the US Army Special Forces. He is often seen smoking a cigarette in game or shown lighting one during cut scenes. Ironically, when Bill dies the cigarette is extinguished. The Assault Rifle is Bill’s weapon of choice and is based on the US Army’s M16A2 which was the standard weapon issued during the Vietnam War. Even bein’ in a war doesn’t prepare you for this. They come at you and come at you and they never goddamn stop! I couldn’t have done it without the tuna sandwich, I tell ya.